Let me start this post with a confession: it only took one weekend in Halifax for me to pick up sticks from Vancouver and move here nine years ago. I love this city. 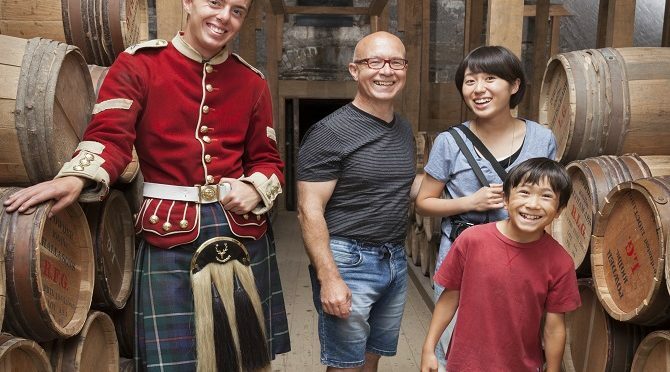 Halifax serves up enough culture and history to give visitors a healthy dose of education about Canada 150, but is also a seriously cool city with friendly locals creating a vibrancy and culture all of its own. Halifax Citadel opens up fully on May 7 (over the winter you don’t get to enjoy all the fantastic experiences, such as hanging out with the soldiers and families of 1784, loading muskets or trying on soldiers’ garb, which my naturally dramatic daughter just loved doing), and as a National Historic Site, it’s free in 2017 as part of the Canada 150 celebrations. Visiting the Alexander Keith Brewery for a tour is also a fun way to step back in time. 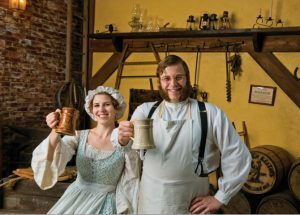 It was established in 1820, so is way older than Canada itself, and animators in period dress walk you through the history of the brewery and Halifax, and then take you to a party with beer and song afterwards (my four year old loved this – minus the beer!). From there, it’s an easy 10 minute walk to the Canadian Museum of Immigration at Pier 21 that served as the port of entry to over a million people into Canada from 1928-1971. There are also plenty of historic graveyards throughout the city, including Fairview Lawn Cemetery where 121 victims of the sinking of the Titanic are buried. Nova Scotia also produces award-winning wine, and has a vibrant community of brewers and distilleries creating exceptional booze. If you are visiting in May, kid-free, you can enjoy Nova Scotia Craft Beer Week (May 5 – 14), and the East Coast Cider Festival (May 27). 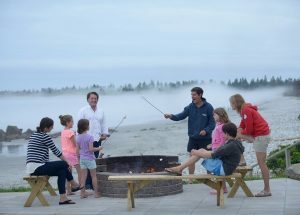 May is when tourist season starts in NS, and many attractions open up for the year. When the sun is shining, you can go out on the Tall Ship Silva for a pirate cruise around the harbour that your kids will adore, or a sunset dinner cruise if you fancy something more romantic. From VIA Rail’s train station and you’re steps away from the fantastic Halifax Seaport Farmers’ Market where you can sample all manner of local deliciousness. 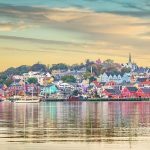 Carry on up the Boardwalk to check out a great playground, the brand new Discovery Centre (a world-class children’s science museum), and the Maritime Museum of the Atlantic which has exhibits on pirates, a large collection of artifacts from The Titanic, and a colourful talking parrot. 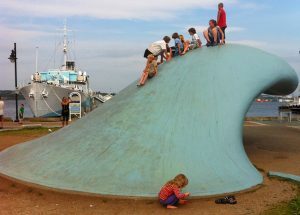 You’ll also find The Wave, a 3.6 metre tall sculpture that kids love to climb (best done shoeless and with a running start). And for those without little ones in tow, in May the much-loved-by-locals Stubborn Goat Beer Garden opens for the season, serving up local beers and gastro-pub fare. There are lots of indie stores set up along the waterfront, and continuing along the Boardwalk you’ll get to peruse the charming collection of shops and cafes of the Historic Properties. 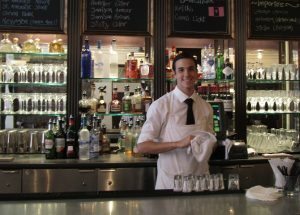 Keep going to the rollicking bar The Lower Deck, which has fantastic live music every day, and if you’ve got a few dollars to spare, finish your walk at the Casino Nova Scotia. Nova Scotia is stunningly beautiful, and you can experience a good taste of it in the 190 acres of Point Pleasant Park, which has beaches and historic military sites right in the city. Rent a car to explore the secluded white sand beaches of the gorgeous South Shore, and stop at family friendly White Point Resort to check out their kids’ fishing derby on May 27. 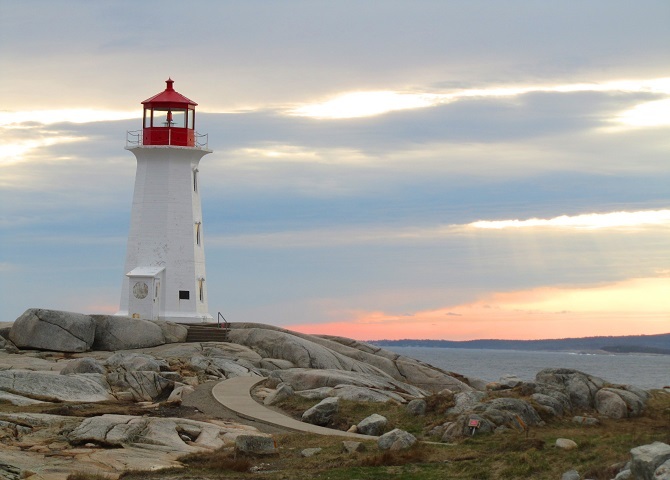 If you are heading that way, you’ll also want to stop in at the iconic red and white lighthouse at Peggy’s Cove (allegedly one of the most photographed spots in Canada) and explore other quaint fishing villages along the delightful Lighthouse Route. You’ll find plenty along the way that exhibits the uniqueness of this part of the country and underlines what makes it so special.